Every week, I answer dozens of emails from people interested in moving to Playa del Carmen. While I am always happy to give my point of view, my perspective on life here as a foreigner, I thought it might be fun and informative for "Life's a Beach" readers to get to know some more of the folks who have made the big leap into expat life. This month, we begin a regular series of interviews with local business people and families who have moved to Playa del Carmen. Unlike other expat interviews found on the web, each of these will be personalized to the interviewees, all of whom we know personally. If you are planning to move to Playa del Carmen, they just may be your neighbors! We may not necessarily see eye to eye with everyone we interview but each of these interviews will be published unedited and in their entirety. As such, I imagine that this particular series will be interesting to follow and prompt quite a few comments and questions. Fire away! This month, we inaugurate this series with Anthony Spadaro and his wife Martina, owners of Advanced Security Systems. Where are you from and how did you end up in Playa del Carmen? I am originally from Sweden and Anthony is from Albany, NY. We lived in Philadelphia before we moved to Playa. We came to the Riviera Maya for vacation a few times and we ended up getting married on Holbox Island (a few hours north of Cancun). We wanted to have a beach wedding somewhere remote (avoiding the biggest tourist sites), but not too far away so that people would want to come. We had been talking about living in another country for a while. Did you move here for professional opportunities or was there a more personal motivation as well? Anthony started selling real estate at one of the real estate brokerage firms here. Also, we welcomed the change of pace compared to the hectic life in the Northeast. What did you both do for a living back in the US and did you intend to follow the same career path here in Mexico? I have a background in online marketing and currently work as an online marketing consultant with search engine marketing as my main focus for several businesses in the area. Anthony’s engineering background has served as a good platform for starting Advanced Security Systems. What differences have you found between doing business here and back home? What was the most surprising difference, either positive or negative? Selling real estate proved to be more challenging than we expected due to the free for all mentality and no regulations or guidelines respected by anyone. Another big difference is dealing with banks here - it is an absolute nightmare. Martina, you have given birth here in Mexico. Were you more nervous or concerned about giving birth to your child here? I was very nervous, but in the end the hospital I chose was really great as well as the doctors, nurses and care in general. What can an expectant family expect as far as the level of OB/GYN care, birth experience and neo-natal care? This was my first time, so it is difficult for me to compare. However, the experience was great, but I was lucky not to have any complications. You child is still very young, but how do you feel about the educational opportunities available for young families with children? I think Playa is great for young kids and we are happy with the educational opportunities at the moment. What also makes Playa special is the mix of people from different countries with kids who speak two or more languages. What criteria did you personally use when choosing your child’s school? Are you pleased, so far with your choice? We needed to feel good with the teachers and their approach with little kids, which we did right away at our school. So far things are good. Anthony, you own and operate Advanced Security Systems. What made you decide to pursue this field? We saw an untapped opportunity in this market after working in real estate. Tell me a little bit about the company and the services you offer. We started our business by focusing on providing security solutions to residential clients, which was a natural step from selling real estate. After a while, we realized that there was a much bigger market potential providing more complex security solutions to large business in the area. To date, most large business had to hire security companies from Mexico City as no companies in the area had been able to provide these types of solutions. It was not easy, but it is not much harder than anywhere else in the world. What were the biggest challenges in the process? Lots and lots of paperwork and everyone trying to charge gringo fees as they think all foreigners have tons of money. Who are your clients primarily? Do you do more independent home installations or commercial work? It’s about 50% at the moment, but we are shifting our strategy to focus on medium to large commercial clients. Have you seen an increase in your business recently? Yes. The global economy and loss of personal income drives the rise in home crimes. Weve also seen a higher demand for IP camera surveillance solutions, where many businesses are ready to take the leap from CCTV to IP video solutions. Companies choose or migrate to IP Video Surveillance as it provides them with a lot more flexibility, scalability, remote accessibility, cost-effectiveness and overall higher quality. If so, do think this is perhaps in reaction to the recent reports in the US media, claiming Mexico to be a "failed state" and overrun with crime due to the "drug wars"? We are talking to government agencies, so we believe that it might be related to the increasing crime rate in the area. What are the most common security risks that the average homeowner needs to take into consideration if they live in Playa del Carmen or keep a vacation home here? Investing in a home surveillance and home automation system is a great way of keeping an eye on a vacation home as it can be managed from anywhere in the world. From a personal safety standpoint, do think that Playa del Carmen is a safe place to work and live and raise family? Playa has been a safe place, but when a city’s population increase so does its crime rate. Playas population has had a double-digit growth for a while and coupled with the current economical climate, we predict that it will become less safe in the near future. What are the biggest challenges and frustrations that you both face living here? The “manana” mentality and being charged gringo fees are difficult to deal with at times. Have you ever considered returning to the US? If so, why? Yes, we think about it at times, but we have no concrete plans on returning to the US at the moment. What brings you the most joy and keeps you here? Good friends and enjoyable climate. 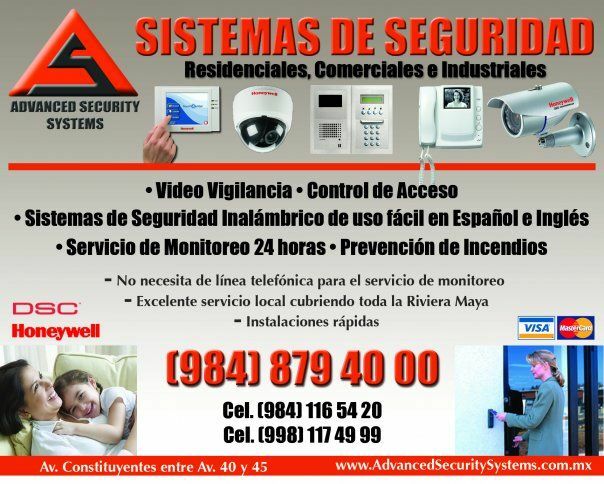 For more information about Advanced Security Systems, visit www.advancedsecuritysystems.com.mx. I especially find interesting the Obgyn q's as I am planning on starting a family in the near future! As I mostly only have Mexican friends.... They have nothing to compare the health care to. Everything I've heard has been great thus far.. One can only hope! Lauren, quite a few of my expat friends have had children here in the past few years. The only complaint is that c-sections are forced upon you. If you are adamant about natural birth, you may need to look for a doula or a mid-wife for an in home delivery. Good luck with the baby making! !